Posted September 25th, 2013 & filed under News . Urbana – The Urbana Adult Education Center, in partnership with the Illinois Community College Board (ICCB), Secretary of State and State Librarian Jesse White and the State Library’s Literacy office along with the Illinois Adult and Continuing Educators Association, invite you to join in a celebration recognizing September 23-29, 2013 as National Adult Education and Family Literacy Week. 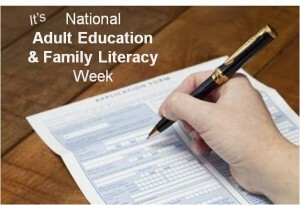 Adult Education programs throughout the state will have special activities commemorating this national event. This observation is intended to raise awareness of the need for programs and services to this adult population as well to highlight the successes. Statistics reveal that over 93 million American adults have Basic or Below Basic literacy skills that limit their ability to advance at work and in education. In Illinois alone, more than 1.7 million adults do not have a high school diploma and approximately 2.34 million immigrants speak a language other than English in their homes. According to the U.S. Census –Index of Need for Illinois, the number of adults with less than nine grades of education has increased by approximately 26% since 2001. Urbana Adult Education enrolled 909 students last year, 90 of those received a high school diploma, 19 received a GED, 18 earned high school credit, 105 passed the CNA class, 119 gained employment, 197 gained a level when post tested, 71 passed the Constitution Test, 80% served were at or below poverty level, and 75% served were underrepresented minorities.